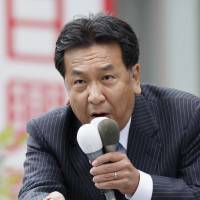 Yukio Edano, founder and president of the Constitutional Democratic Party of Japan, is taking the spotlight ahead of the general election. The CDP, just two weeks old, is expected to become the second-largest opposition force after Sunday’s election, media projections show. It is gaining great momentum from liberal voters who find themselves running out of options. According to the latest forecasts, the conservative Liberal Democratic Party led by Prime Minister Shinzo Abe appears headed for a landslide victory as the conservative Kibo no To (Party of Hope) loses steam from disillusionment with Tokyo Gov. Yuriko Koike’s publicity stunts. The upstart party was initially expected to be a powerful challenger after Koike’s success in the Tokyo Metropolitan Assembly election. Meanwhile, according to an opinion poll conducted over the weekend by Tokyo Broadcasting System Television Inc. (TBS), the CDP’s support rate stood at 7.3 percent, giving it an edge over Kibo no To, whose support stood at 5.2 percent. “People have been frustrated with tabloid TV shows dealing only with political mergers and alliances. They feel politicians are not being straight with the people,” Edano told reporters in an interview with The Japan Times and other media outlets on Monday in Tokyo. Edano said many voters have been discontent with Abe’s administration but have not found any opposition alternatives they can support. “We have been supported by people like that. We are a symbol of grass-roots democracy, or should be,” the former deputy chief of the Democratic Party said. The DP’s Lower House caucus was disbanded on Sept. 28 to let its members join Koike’s party. Edano instead founded the CDP to help liberal members of the DP who were barred from joining Kibo no To. He was also one of the founding members of the DP’s predecessor, the Democratic Party of Japan, founded in 1996. But Koike’s blunt declaration to “exclude” the DP’s liberal members from her fledgling party made an impression on voters and is shaping its fortunes. According to a forecast made Sunday by Jiji Press, only 57 of Kibo no To’s 235 candidates are expected to make it into the 465-seat chamber, while as many as 40 of the CDP’s 78 candidates might win seats. Edano emphasized that his CDP will never be a part of any number games at the Diet after the election. 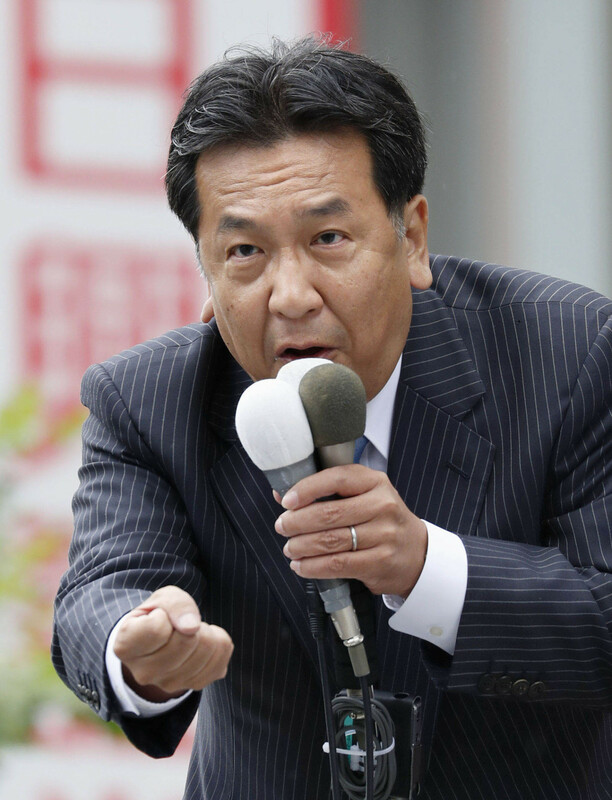 Voters are fed up with the political wrangling in Nagatacho — the epicenter of Japanese politics. The continued emphasis on maneuvering is overshadowing the need to debate policy — the very factor that is boosting the CDP, Edano explained. “We have clearly said we will remain an opposition party after this election. We will try to achieve power through the general election after this one” without resorting to alliances, he said. Edano’s party advocates “constitutionalism,” a concept that the government’s authority derives from the people and should be limited by a constitution designed to protect them from the abuse of government power. In 2015, it became a buzzword for politicians and activists who opposed the Abe administration’s controversial reinterpretation of war-renouncing Article 9 and its enactment of two divisive security laws criticized as unconstitutional. The CDP shares these views and is pledging to keep Article 9 unchanged. But Edano said he doesn’t believe his new party should be categorized as either left or right. He says embracing the word “liberal” today would conflate too many political meanings in different countries. The CDP’s basic platform includes policies usually considered liberal in Japan: empowering citizens rather than the state; establishing a society where diverse values and human rights are respected; and creating an inclusive community where members support each other. Edano has been avoiding the term in an apparent effort to reach out to a wider range of voters. “Instead we call it a ‘grass-roots movement.’ I’ve never said we are ‘liberals,’ ” he explained. As used in Japanese politics, liberal is often associated with left-leaning lawmakers who are backed by labor unions. The DP was often hurt by internal strife between left-leaning pacifists and right-leaning hawks, particularly over constitutional issues.